Along the professional journey of many of the UK’s renowned dentists, it is safe to say the Vanini Masterclass has been a highlight to remember. Providing its participants with a foundation on which to flourish, the experience offers a unique opportunity to reach new heights in aesthetic restorative dentistry. Many delegates who have attended the course over the years are not only valued customers of Optident, but have become true friends; joining a community in which learning and enjoyable social activities are at its heart. The Vanini Masterclass is one of the most illustrious courses of its kind and comes highly recommended. Relocating from one beautiful location (Lake Como) to another – the dramatic Ligurian coast – this setting is the perfect backdrop to capture one’s imagination when aesthetics in nature is the primary objective. It goes without saying that the Vanini Masterclass is a truly remarkable course that qualifies for a place on everyone’s bucket list. The Masterclass offers a unique chance to see the developer of the Enamel Plus HFO / HRI composite system and one of the leading restorative dentists in the beautiful setting of Genoa, Italy. The purpose of the course is to teach a modern and innovative technique for the conservative restoration of anterior teeth with composite materials. This method implies a new and original approach, where the indications for composite restorations, colour determination, the compilation of the colour chart for the communication and documentation of the case, the preparation of the cavity, adhesive techniques, layering, finishing, and polishing are considered in a different way. Dr Vanini also discusses the importance of material selection and placement relative to a balance occlusion and its effects on patients’ posture. The planning of each step makes this a standardised technique that gives reliable results. The teaching programme is supported by the projection of a rich range of clinical cases that have been documented over the last 20 years, adding data from the research and analysis of the international literature, with videos showing the most important steps of the technique. Participants will enjoy the clinical demonstrations from previous patients with a hands-on session under the direction of Dr Vanini and his dental technician. Without doubt, this is a course that people will leave having gained a greater understanding of the nature of the tooth. Vanini Masterclass alumni, Dr Charlotte Hallos, commented: ‘I found the course absolutely brilliant and would highly recommend to anyone considering it. I can honestly say the whole experience from start to finish was world class’. 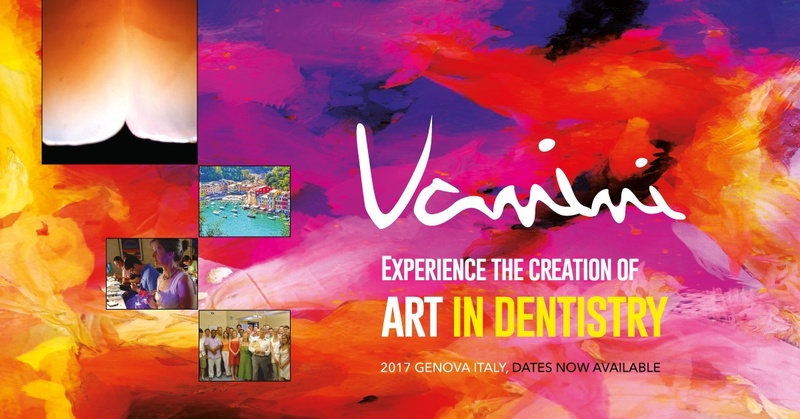 This year the Vanini Masterclass will take place at the home of HRI Composite at the Micerium Facility in the stunning town of Genoa on the Ligurian coast. Sunday 16 July is classed as a free day and delegates can either take an early flight home or spend the day sightseeing in Pisa. For more information and to book contact optident.co.uk/course/vanini-course-2017 email courses@optident.co.uk or call 01943 604 400.